This section will give you a guideline on the practices and hashkafah (guiding philosophy) of our community. Below you will find a list of accepted hechsherim (Kosher symbols) as well as guidelines we use in the synagogue regarding the kitchen and general decorum. We have a vast and diverse community and we are respectful of individuals of all denominations, background and practice. The standards found here are a guide to the practice within the synagogue as well as the general community, but by no means present a monolithic expectation. For more specific questions, please inquire of the Rabbi or your own posek. We are a shabbos observant community, with a diverse mix of observance levels among our community. We welcome all levels of observance at NCS. With that acceptance in mind, our parking lot is never closed. We encourage those who are able, to walk on shabbos and yom tov, but we never judge those who cannot. We ask all those who attend NCS for shabbos services to respect those who do observe a strict level of shabbos, by not violating the shabbos within our building. To that end, we ask that the lights are not turned on or off in our building. Additionally we ask that cell phones do not enter our building on shabbos, with the exeption of doctors on call, or others with Rabbinic permission. If one must bring a cell phone, we ask that it be on silent, and that phone calls are not made or received within the building. Additionally we do not permit photography of any kind during shabbos, nor do we allow any other external electronics. We also ask all those males in attendance to cover their heads the entire time they are within the building. As a Traditional Synagogue we pray regularly on shabbos with the option to be seated mixed (men and women) or to seat separately behind a mechitza allowing for three sections, mixed, men only and women only. We hope in this way that all those who come to NCS will find a comfortable place to daven (pray). Our community observes various levels of kashrut. In the synagogue the strictest of kashrut (non-Cholev Yisrael, non-yoshen) are followed under the direction and certification of Rabbi Aaron Braun. In our homes, with the hope that meals will often be shared, we ask that those community members either follow the guidelines found here, or express to guests where they diverge in practice. That way we can all feel comfortable eating in each others homes or feel empowered to make informed decisions. Below please find the current list of acceptable hashgakhas (certifications) as well as our kitchen standards and practices. If you have further questions, please do not hesitate to contact the Rabbi. Catering: All catering must be approved by the Rabbi before arrangements are to be made. A list with the approved caterers may be found in the main office. The catering must either be certified by an Orthodox institution or the cooking be done in our kitchen under our Rabbi’s supervision. Please make your caterer aware that no item in our kitchen may be kashered to accommodate anything other than what it is currently used for. In other words, the dairy oven may be kashered to accommodate the cooking of dairy only, but it may not be kashered to be used for meat. Kitchen Usage: All usage of the NCS kitchen must be preapproved by both the Rabbi and the Head of Kitchen. Approval must be sought out with a reasonable amount of advanced notice. Please note that at the current time our kitchen remains at a dairy-ready status. Any fleishig cooking needs significantly more notice, as the kitchen will need to be prepared for meat-ready status. Fleishig and dairy may not be handled or cooked in the kitchen at the same time at any point. In order to change from one to the other, all items from the first food-type must be cleaned and put away. Locks must be secured and the keys returned to the Rabbi before the second food-types keys will be released. Please do not plan to cook meat and dairy in the same day, as the process to change from one to the other is not a quick process and must not be rushed. Liquor: All alcohol entering the NCS kitchen or for use during NCS functions must be approved by the Rabbi in advance of its entry into the kitchen. All wine must be mevushal in addition to being certified kosher. The CRC alcohol list is a good starting point for approved liquors. No CRC approved alcohol will be prohibited from use, but some not listed may also be acceptable, please consult the Rabbi if you have questions before you purchase. Other Beverages: Depending on the beverage and manufacturer certain beverages may or may not need a heksher. NOTE: Any beverage that does not need a heksher but happens to bear a heksher which is normally not acceptable (for example: Triangle K on a grape-free juice), would be acceptable in our kitchen. Please see the CRC list of acceptable beverages or consult the Rabbi for a fuller understanding of what does and does not need a heksher. Food: All food entering the kitchen must be checked for approval by the Rabbi. If the Rabbi is unavailable all entering items are to be placed on a cart (still in original shopping bags) and marked “unchecked”. If the purchased items require refrigeration the cart may be moved into the refrigerator. No precooked food is allowed in the kitchen unless sealed and packaged with an acceptable heksher. (Private) Non-Kitchen Food: All food entering NCS must be kosher. While home cooked food from a kosher kitchen will be allowed in the building (for personal use only, in other words nothing home cooked may be brought into the kitchen or served to others) any non-kosher food will need to be disposed of before entry into the building. This includes ‘kosher’ items bearing advertising for non-kosher establishments, for example a soda from McDonalds would not be allowed in the building regardless of the status of the soda itself. Notable exceptions are coffees from coffee based vendors such as Starbucks, Caribou, etc. since these establishments do not primarily market the non-kosher food that they serve. Volunteers: All volunteers in the kitchen are appreciated and we are grateful to all who volunteer. Due to halakhic considerations when cooking is taking place the Rabbi or other shomer mitzvoth must be present. Exceptions may be granted based on the camera monitoring system. No cooking may take place on Shabbos and cooking on Yom Tov may only take place if the Rabbi is present in the kitchen. Utensils: All new utensils entering the kitchen must be presented to the Rabbi before their entry. Metal and glass utensils MUST BE TOYVELED in a mikvah before their entry to the kitchen. Items must also be labeled (meat or dairy) and placed in the appropriate area before they may be used. 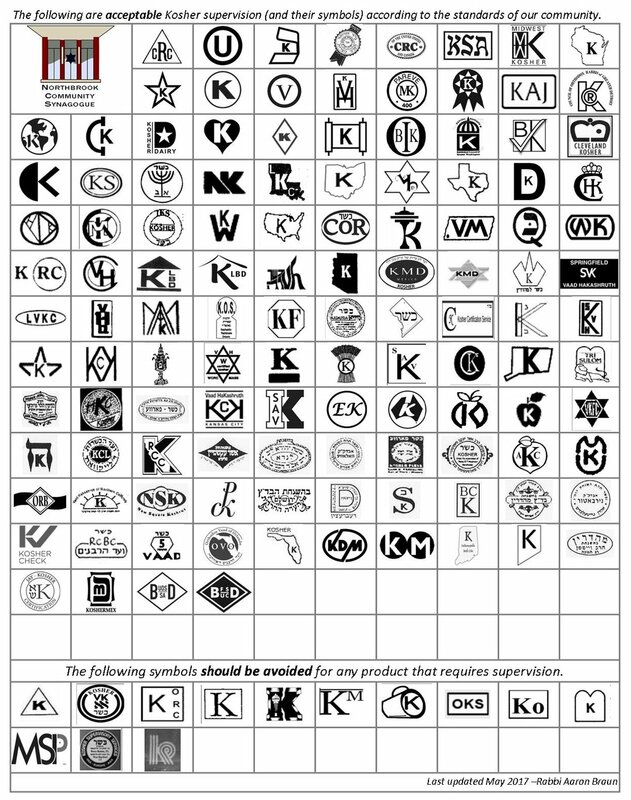 As a matter of logistics, not kashrut, new items of porcelain or other non-kasherable material will not be accepted into the NCS kitchen (with the exception of cheap crock-pots which must be used for fleshing only and which will not constitute a significant loss if they need to be thrown out due to kashrut issues, other exceptions are up to Rabbinic discretion.). Donated (used) items will be accepted only so long as they meet the above criteria and are kashered, labeled, and toyvelled if necessary, before entry to the NCS kitchen. Disposables: All disposable items (including but not limited to aluminum pans and plastic trays) entering the kitchen may be used once and then must be thrown away. Used disposable goods may not be stored in the kitchen nor used in the shul for any purpose.